Of the many problems that exist within mental health globally, one of the most significant and pernicious is one that most people do not even realise exists. Presenting itself as the major source of solutions to emotional and mental health problems, mainstream psychiatry is in fact a creator of many of the problems within global mental health. While working as a GP over twenty years ago, it gradually dawned on me that, generally, when psychiatrists stated ‘we know‘, they often didn’t know – they believed. The National Institute of Mental Health does not know that mental disorders are brain disorders; they believe this, and they want you and everyone else to believe this too. Psychiatric diagnoses are not known brain disorders – and that is the simple truth. If they were known brain disorders, they would come under the remit of the acknowledged medical brain disorder experts – neurologists. Brain disorders – such as multiple sclerosis, dementia, brain tumours, Parkinson’s Disease – have identified brain pathology that is specific to that disorder. No such brain pathology has been identified in relation to any psychiatric diagnosis – including depression; bipolar disorder; schizophrenia; obsessive compulsive disorder; schizoaffective disorder; personality disorder; eating disorders; anxiety disorders. There are no brain or other tests that can be carried out that confirm the presence of a brain disorder in relation to any psychiatric diagnosis, as there are in multiple sclerosis, brain cancer and the majority of brain disorders. There are no specific findings upon examination of the brain at post-mortem, as there is in dementia, for example. The truth is therefore simple and straightforward: Psychiatric diagnoses – also referred to as so-called mental illnesses or mental disorders – are not known brain disorders. A reliable way of checking whether or not psychiatric diagnoses are known brain disorders is to examine authoritative sources that contain comprehensive lists of brain disorders. If psychiatric diagnoses were known brain disorders, then obviously they would be included in comprehensive lists of brain disorders. So I checked out the website of the American National Institute of Neurological Disorders and Stroke (NINDS). 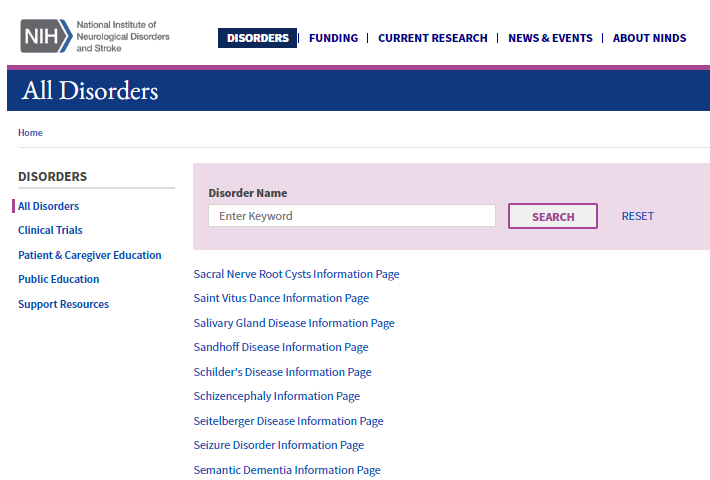 The NINDS website contains an extensive list of neurological and brain disorders, the most comprehensive such list that I have seen in 35 years as a medical doctor. 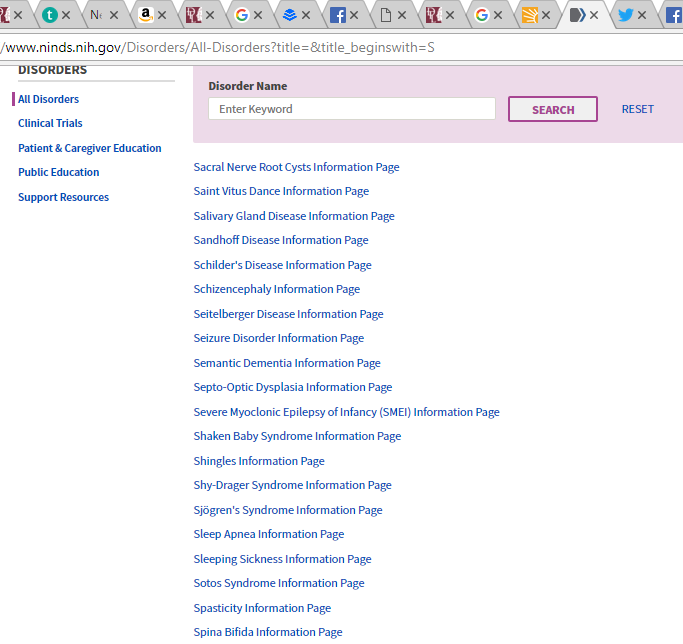 On the lower left hand side of the above screenshot, you can see a whole series of links in alphabetical order – links to the list of known brain disorders that begin with each letter of the alphabet. Of the main psychiatric diagnoses, schizophrenia would generally be considered to be towards the most severe end of the spectrum. The experiences and behaviours that are collectively referred to as ‘schizophrenia’ are widely believed to be a known brain disorder. According to the American Psychiatric Association, as illustrated in the first line of the above screenshot, it is a known fact: ‘Schizophrenia is a chronic brain disorder’. Given that the medical profession is one of the most trusted professions in the world, one might reasonably assume that these words of the American Psychiatric Association must be true, must be based on solid facts. Surely if the American Psychiatric Association says that ‘schizophrenia is a chronic brain disorder’, this must be an established fact, right? And if this is indeed an established fact, one should fully expect to see schizophrenia listed as a brain disorder in the extensive list of brain disorders on the website to the National Institute of Mental Disorders and Stroke (NINDS) I mentioned earlier. If schizophrenia really is a known brain disorder, then it would definitely appear here, between the sixth entry, ‘schizoencephaly’ and the following entry, ‘Seitelberger Disease’. But there is no mention whatsoever of schizophrenia. This is the most extensive list of brain disorders I have ever seen. It contains many hundred brain disorders so rare that I have not heard of them in 35 years as a medical doctor – including seven of those listed in the above screenshot alone. Yet schizophrenia is not referred to at all, despite assertions that schizophrenia is not uncommon, affecting 1% of the population. How can we make sense of this apparent contradiction – the American Psychiatric Association asserting unequivocally that ‘schizophrenia is a chronic brain disorder’, the National Institute of Mental Health stating that ‘mental disorders are brain disorders’, while its sister’s organisation – the National Institute of Neurological Disorders and Stroke – does not include schizophrenia or any other psychiatric diagnosis in its very comprehensive list of mental disorders? The answer is simple: schizophrenia is not a known brain disorder, and this is why schizophrenia does not appear on this extensive list – and why there is no mention on this brain disorder list of depression; bipolar disorder/manic depression; obsessive compulsive disorder; eating disorders; anxiety; or any other so called mental disorder. How about other lists of brain disorders? Other lists of brain disorders similarly make no reference to schizophrenia or other so called mental illnesses. WebMD is a respected medical site, providing information for the public on a wide range of medical problems. The WebMD website includes a list of brain diseases, within which there is no mention of schizophrenia or any other so called mental illness. The Australian Brain Foundation website also contains an extensive list of brain disorders – no mention of schizophrenia or any other so-called mental illness there either. The medical profession want you – and everyone else – to believe that the experiences and behaviours that come to be collectively described as so-called mental illnesses are brain disorders. They want you to believe this, not because it is true – it isn’t true – but because you and everyone else believing this strengthens their position at the top of the global mental health pyramid. Major benefits accrue to psychiatry as a consequence of being widely seen as the most expert mental group. Psychiatry wants their dominant position in global mental health to continue. And this is why so many supposedly authoritative medical sources like those I have referred to here – the American National Institute of Mental Health and the American Psychiatric Association – are willing to misinform the public, asserting unequivocally that so-called mental disorders are known to be brain disorders, when the facts clearly state otherwise. Clearly it is wrong that the medical profession would misinform the public it serves in this manner. This systematic misinforming has resulted in the widespread misunderstanding of the experiences and behaviours of people who become diagnoses with various so-called mental illnesses. A serious consequence of this misinformation is the failure of health authorities to adequately consider other ways of understanding these experiences and behaviours and the people who experience them. Thus, millions of people around the world are deprived of opportunities to heal, to progress through their difficulties rather than having to settle for a compromised life, with much distress and despair. It is scandalous that they get away with this, but this is what happens when no one polices authority, when authorities – including medical authorities – are not held accountable, as they clearly should be, in the public interest. Depression Delusion: The Myth of the Brain Chemical Imbalance (2015) – Foreword by Robert Whitaker, author of Anatomy of an Epidemic.